From building inception through construction completion, Jobco provides a complete range of realty development and construction services for government projects, public, and private developers, and property managers. 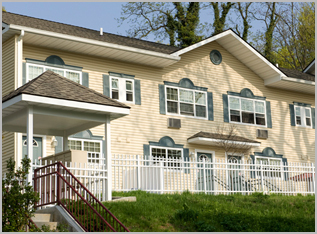 With hundreds of projects under its belt, Jobco has produced more than 10,000 units of new or rehabilitated housing. Our clients trust Jobco to minimize risk and deliver outstanding development and construction solutions. Jobco’s reputation for quality was founded partly on building schools and churches during Long Island’s rapid population growth period in the 1960s. In fact, Jobco is responsible for completing more than 80 municipal public works projects, ranging in size from small renovation, to large government-financed apartment buildings, schools, and modern hospitals, and medical facilities. Today, we continue to create superior yet affordable living and working environments that individuals and families can be proud to call home. We value our role in the communities we serve – and each one is a reflection of our tradition of excellence. Jobco develops and executes plans that enrich lives through better building complete with quality construction, responsive management, timely renovation and cost-effective project completion. From inception to completion, we revitalize communities with the utmost in professionalism, quality, and excellence. Our track record of success has afforded Jobco the opportunity of working repeatedly with many government agencies, including the U.S. Department of Housing and Urban Development (HUD), the State of New York, the City of New York, and numerous suburban housing authorities, school districts, and municipalities. In addition, we have a deep understanding of public sector project funding, including Low-Income Housing Tax Credits, Home Funds, Tax Exempt Bond Financing and Grants, and Turnkey Developments. The efficiencies learned from our government assisted projects, transcends all of our work. We are also familiar with legal, compliance issues, and public hearing expertise. Enriching lives through better building. Our ongoing commitment to this philosophy has resulted in strong client relationships and a business base that continues to grow through a steady stream of referrals and repeat business. Perhaps more importantly, we continue to create superior yet affordable living and working environments that individuals and families can be proud to work and live in. Through our extensive experience in all three facets of the building process – as owner developer, general contractor and property manager – Jobco has a unique perspective on construction management to make a house a home and positively impact your return on investment. We take pride in satisfied customers and value our role in the communities we serve. We invite you to take advantage of our expertise by giving us the opportunity to discuss how our unique capabilities can work for you on your next project.